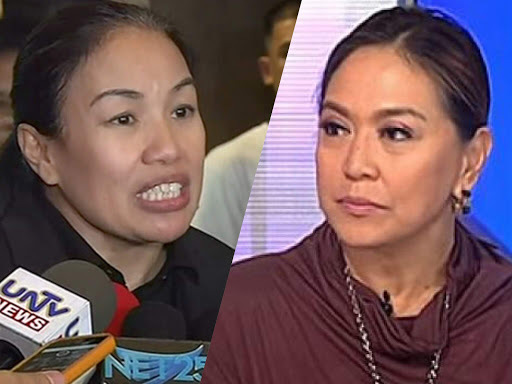 The prolific and gutsy reporter Karen Davila has been called out by a lawyer for apparently comparing “apples with santol” or, as in this case, Carlos Celdran with President Rodrigo Duterte. Davila was wrong in saying through a tweet, “To the Supreme Court: How can @carlosceldran be penalized for Offending Religious Feelings when no less than the President has cursed the church?” after Celdran posted the SC’s affirmation of his case. 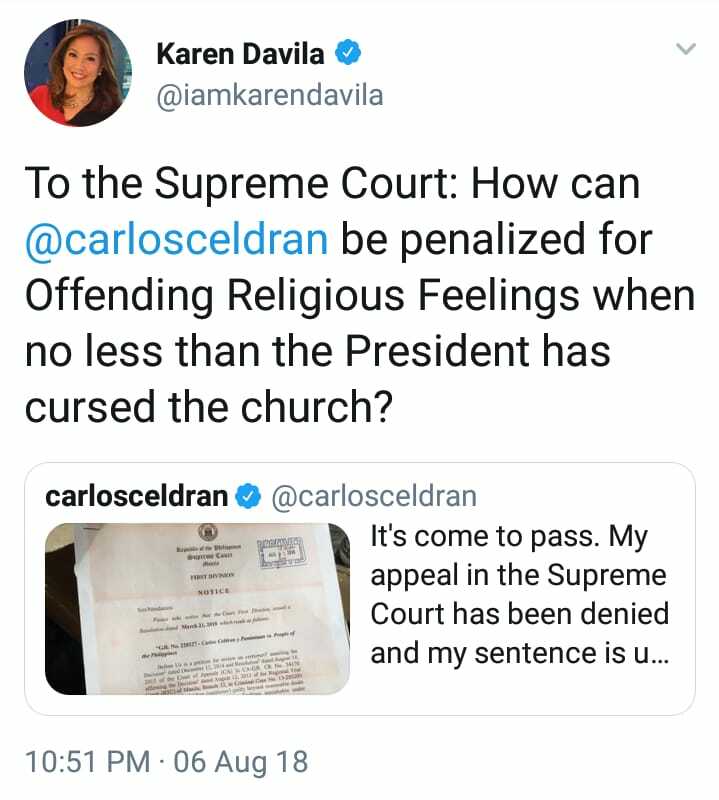 The social media influencer attorney explained that Celdran had blasphemed the Church in its very area during mass, or as Article 133 of the Revised Penal Code states, “in a place devoted to religious worship or during the celebration of any religious ceremony”. Duterte, on the other hand, simple exercised his freedom of speech when he criticized the Church during one of his speeches. “Mahalaga ang pagkakaibang ito. Pinasok ni Carlos ang simbahan para tawaging Damaso ang mga pari. 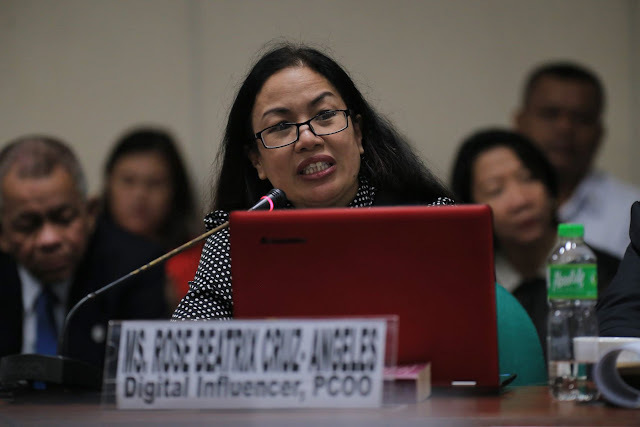 Ayon sa Simbahang Catolica, may padasal nung nangyari ang insidente,” Cruz-Angeles reasoned in a Facebook post. The lawyer cleared herself of any allegiance or siding with the Church, but she explains that Davila was wrong for comparing the two over a very different mode of delivery and context towards the Church. “Covered pa ng freedom of speech ang pangulo. Yung kay Carlos, krimen na, ayon sa hukuman,” the attorney said. Ms. Karen Davila compares apples with santol. Carlos Celdran performed acts that the court deems offensive to the feelings off the faithful, IN A PLACE DEVOTED TO RELIGIOUS WORSHIP. The president wasn't in church when he mouthed off. Mahalaga ang pagkakaibang ito. Pinasok ni Carlos ang simbahan para tawaging Damaso ang mga pari. Ayon sa Simbahang Catolica, may padasal nung nangyari ang insidente. Parang pumasok sya sa bahay ng iba para mang insulto. Hindi ibig sabihin nito na pumapanig ako sa simbahan. Pero hindi tama yung pag compare ni Ms. Davila. Covered pa ng freedom of speech ang pangulo. Yung kay Carlos, krimen na, ayon sa hukuman. By the way, ang initial conviction ni Carlos was January 2013. Na uphold ito ng Court of Appeals nung January 2017. Two days ago natanggap ni Carlos ang affirmation ng SC. Ibig sabihin nito, walang kinalaman si Duterte dito.